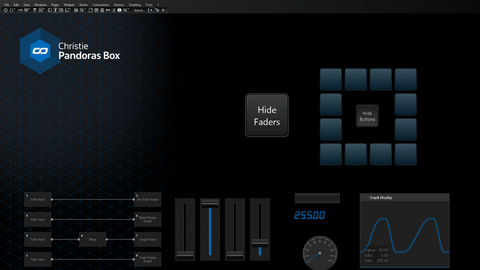 When starting WD, you will see an empty screen with a main menu bar and a toolbar containing all available widgets. The empty screen represents the main background of your application window. 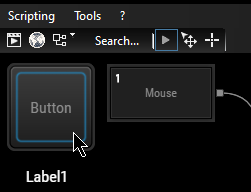 A right-click here opens a context menu that offers ALL options from the main toolbar as well. Please see the following topics for detailed description regarding the different menus, from File Menu until Tools Menu. The topics Project Settings and Window Settings explain how general settings can be influenced. For example, if you are creating a touch screen user interface, you can hide the standard windows borders and the icons to close, maximize or minimize the application. The last topic within this chapter lists all available keyboard shortcuts. You may use the entire background area to create and position any controls you wish to be part of your user interface (UI) to remote control Pandoras Box or any other device connected. The default "run mode" makes the function of each tool available. For example, buttons may be clicked, fader bars may be dragged. Tools that are remoted by incoming data behave accordingly. Or click the play symbol in the toolbar. In the "edit mode", also called "move mode" you may move, resize and copy any controls and - if talking about nodes - connect them. In order to select an item, simply click on it. In order to select multiple elements, left-click and drag a selection frame or click on additional items whilst holding the CTRL key. 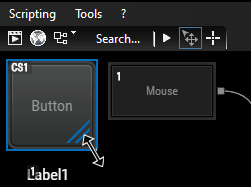 To draw a selection frame, hold the left mouse button whilst dragging the mouse. If you start somewhere and drag to the bottom right side, a blue selection frame appears selecting all items completely surrounded by the frame. All other directions create a green frame, selecting all items it touches. Most widgets will show a small diagonal double arrow icon at their bottom right corner. Click and drag it to change the size. All standard user control and nodes support copy and paste with [CTRL+C] and [CTRL+V]. If you need to delete an item, right-click on the element and click "Delete" or select it and press the delete key on the keyboard. Even though data is still calculated and processed in the background whilst being in the edit mode, tools and labels will only be updated as soon as you switch back into the run mode. 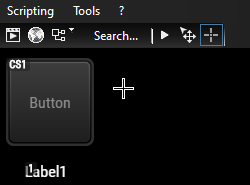 Or click the arrow cross symbol in the toolbar. The third operating mode is only active if you have chosen an item from the widgets menu or nodes menu. WD will automatically change the mouse cursor to a crosshairs icon. Wherever you left-click now, the chosen item is generated. When you have as many copies from the item as you need, enter the edit mode to edit, e.g. resize them or enter run mode in order to use them. It is possible to deactivate the create mode after creating a widget per default, please refer to Profile Settings. Or click the crosshairs symbol in the toolbar. The edit dialogs contain different, extendable sections. Widget Designer remembers which panel is extended and which not for all other newly opened dialogs. The check box at the right side of each bar allows you to keep the panel opened when it is ticked. If it is unchecked, the panel will close as soon as another one is opened. The default behavior can be set in the User Profile. All edit dialogs offer the possibility to "Automatically apply changes", this mode is ticked by default. All changes involving check boxes, buttons and drop-downs will be applied directly. Changing the content of a text box will take place as soon as you leave the box or press [Enter].